We now offer the very best hand-made exhaust systems available on the market for your classic from Sanderson. These headers are not mass produced on an assembly line but made one at a time in proprietary jigs, using the the best materials and tooling available. 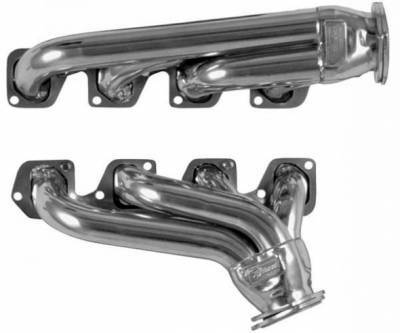 Since 1964 these headers have been the best performance exhaust product available. These Shorty Block Hugger Headers Will Clear The Shock Towers In 69-73 Classic Mustangs. Includes All Hardware Necessary For Installation. NOTE: Will also work in 65-70 Mustangs with Mustang II Style front suspensions that remove the stock shock towers. We now offer the very best hand-made exhaust systems available on the market for your classic from Sanderson. These headers are not mass produced on an assembly line but made one at a time in proprietary jigs, using the the best materials and tooling available. Since 1964 these headers have been the best performance exhaust product available. We offer the only patented leak-free flange on the market. Our design is so unique that no gasket is required! We start with 3/8" steel plate, which is precision laser cut using our own template designs. After assembly, a weld bead is built up around each exhaust port and all bolt holes. This bead is ground to uniform thickness with such accuracy that instead of a gasket, all that's required to seal the header to the engine is a bead of Permatex Ultra Black. Will also work in 65-70 Mustangs with Mustang II Style front suspensions that remove the stock shock towers. The FC4 header features flanges for four barrel (4V) cylinder heads. If you are using two barrel (2V) cylinder heads you must also purchase our copper adapter plates. Our 351C headers features flanges for four barrel (4V) cylinder heads. If you are using two barrel (2V) cylinder heads you must also purchase our copper adapter plates, part #2BBLFC. The Patented Leak-Free Design that Sanderson Headers offer you is the only leak-free flange design on the market ...Do Not Attempt To Use Flange Gaskets! The raised flange on the Sanderson Headers will buckle the gasket during tightening and actually cause a leak!